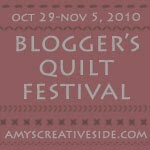 I almost missed the last day of Blotoberfest 2010. Have a safe trick or treat (if you participate). I had a hard time choosing between this one & another quilt... In the end I chose this one because at the time it represented all of my taupes. I had been collecting & looking at these fabrics for a long time without using them. They were expensive & I was afraid that I would be dissatisfied with the result so I did not make anything with them... Once I got going I was fine & enjoyed making this quilt. I love the way it has high contrast & low contrast blocks & how it allows all of the different colors to play nicely together. 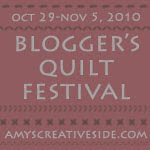 Bloggers quilt festival link: here! Another one from that local quiltshow a couple weeks ago. I guess these are her scrap baskets. Hardee har har! Damn my memory is for crap. http://www.flickr.com/photos/11712869@N00/1367478520/ (She used blue & green prints from Denyse Schmidt's Katie Jump Rope line of fabric.) I like it so much that I asked if I could copy her! Unfortunately I only have fat quarters & she had to have used half if not whole yards. Raise your hand if you did not know that I work on too many projects at once. O.K., now that brings us to this photo. That poor partial bolt of kitties in trees fabric has been planned to be several quilts already (I've owned it since 2007 if not earlier) all of them included the solid-y browns. I am 99% sure that I have settled on the final pattern & it too includes browns - most if not all of these plus several more. More really is more. The final pattern is Marquee, a pattern by Weeks Ringle & Bill Kerr in their book Modern Quilt Workshop (I still highly recommend this one whenever I am asked to recommend a quilt book). My back will be scrappy browns including all of my "natural" & brown cat prints. So my family had its first Chuck E. Cheese experience yesterday & lived to tell. My almost 2 year old was invited to a 4 year olds birthday party - there were 8 parties going on simlutaneously in addition to what I assumed to be random, "Let's go to C.E.C. for dinner" groups. I then take him to the big race horse - he is freaked out by the prospect, so I bring him back to the merry-go-round for a photo op - still freaked out. Luckily we hear that the pizza is being served. So we go back to eat. He ate almost 3 slices & then a bit of cake. YUMMY. All of the mouse, etc. antics were beyond his understanding - so maybe we can avoid this place in the future? While the 8 birthday children are taking turns doing the birthday kid stuff & after lunch, I took Jacob back to the merry-go-round - just in case. As you can tell from this photograph he loved it once again! So much so he did not want to leave. Another one from the local quilt show. I am not sure if this is a table runner or a wall hanging & I am also not sure that it matters. I only wonder, because I am not a "runner" girl... Meanwhile, I have 12 foot ceilings with a cut out between the living room & kitchen & something like this would look lovely above that cut out. Another one from the quilt show. It is officially fall in the Mid-Atlantic so this tree of life quilt in Autumnal colors is appropriate. Fodder for my hexagon quilt. The big helper likes to help with the vacuum. My husbands foot is recoiling the electrical cord, while my son's foot is working on the power. While the vacuum is in action, he plays with the shag to hard wood setting & has fun with the air vent. On another note, I baked pumpkin cookies last night & my cookie theif helped himself to 1, while saying, "Cookie." - not bad considering the fact that he had the whole cooling rack at his disposal. Yesterday was sew-n-tell Sunday & this was my contribution. To make the cake: Center a rack in the oven and preheat the oven to 350F. Butter a 9- to 10-inch (about 12-cup) Bundt pan. Do not place the pan on a baking sheet - you want the oven's heat to come up through the Bundt pan's open core. Put the flour, baking powder, baking soda, cinnamon, ground ginger, nutmeg, cloves (if using) and salt in a bowl and whisk to combine. Set aside dry ingredients. Working with a stand mixer (using a paddle attachment, if you have one), beat the butter and both sugars together at medium speed until light and fluffy. Add the eggs, one at a time, and beat for 1 minute after each addition; beat in the vanilla. Reduce the mixer speed to low and add the pumpkin and apples - don't be concerned if the mixture looks curdled. Still on low speed, add the dry ingredients, mixing only until the flour is just barely incorporated. Working with a rubber spatula or wooden spoon, stir in the cranberries and pecans. Scrape the batter into the pan and smooth the top with the spatula. Slide the pan into the oven and bake 60 to 70 minutes at 350F, or until a knife inserted into the center of the cake comes out clean. Transfer the cake to a rack and cool for 10 minutes before unmolding. Cool to room temperature on the rack. As mentioned previously, I went to a local quilt show this afternoon. (After & before some major errand running!) This one might have been my favorite. Can anyone tell what this quilt depicts? because I am going to a quilt show tomorrow! Just keeping it balanced & real. minutes later, the sheer joy was replaced by this sad face. The previous shot shows you how giddy he was at the result! Seems that Jamie Oliver wants kids to be able to cook real food & I've seen a list or two of stuff that people think that young people should be able to cook. But I am posting to get you ready for a personal challenge. As you can tell this photo was taken in a sports bar - Hard Times Cafe. They are known for their chili offerings - 4 varieties, we opt for vegeterian. Anyway I am posting this because somethign happened last night that I thought would "NEVER" happen. We did not have any jarred spaghetti sauce at home. (Yes, we eat the jarred stuff & yes I can make it from scratch - I even had everything on hand last night, but I did not have the time. You see I was making vegeterian chicken parmesan (Morning Star makes a chickpea patty that I like better than any chicken cutlet I've had. & I prefer real cheese to the fake stuff...) I cooked the patties thinking that I would heat up the sauce at the last minute - while the cheese melted... NOPE. So we had chick pea patties with a rice & vegetable blend & a mineola for dessert. This photo shows the grainary that belonged to General George Washington, First President of the United States of America. Out of this photograph to the right is a reproduction of his distillery. He was such a trooper that day. We started out at Panera for bagels & cream cheese - he sure does love his cream cheese. Yes, that is my old clamshell MAC. I keep it for movie watching when we lose electricity. Since he likes to help & I was trying to read e-mail, I pulled it out for him so that he could push those buttons. Then I turned it on which created a noise - he then kept pushing the power button until he found the Caps Lock button that had the more immediate response of lighting up! I am not sure how often we are going to feed this monkey! First, Happy Columbus Day. To celebrate, we are going to Mt. Vernon with my MIL who is in town for the day (They were in Annapolis for a boat show yesterday). The photo is of my son kissing the cat. I am having a hard time capturing this scene. She only likes me, she tolerates everyone else. So she was not cooperating or happy. I was holding the cat & trying to take a picture with my hand over my head. I am actually quite surprised "I" can tell what is going on in this photo. Yesterday Jacob & I went to the Pumpkin Festival at Butler's Orchard in Maryland. We rode the hay ride to the pumpkin field. All was not fun & games. The hay got stuck in Jacob's socks & the pumpkin patch had vines that tripped him... There were some fun times too - at the games section! He loved the ball toss & the rubbery ducky races. There was even a tunnel that he had fun walking through. Munki Martians, FMF & friends! I know I have shown this group (well most of it) before, but here it is again. I have removed some & added others... Always fiddling. Because, I cut some of the red for the hexagon quilt & I have decided that I will be using Kona Mocha (need to get that down in print) for the sashing of the eventual blocks. I am also writing this now, because I am ready to start to cut for the blocks so that I can use some (all) of these fabrics in my hexagon quilt. Am I over thinking this considering that at the end of the day there will be about 1400 pieces in this quilt? Once upon a time ago, I lived in a studio apartment that rivaled many closets in size. I used to trim blocks while sitting in my bed. June Taylor cut & press 2 - was & still is my friend. I cut some more fabric for my hexagon quilt last night. & I pulled some of my more favorite prints from the doubles/tripples/quadruples pile & added them to the primary pile. We'll see how & if I use the remains of the d/t/q pile. 2. Yes, that is a potato chip - everything in moderation. & for the main reason for this post. Yesterday Ledo's Pizza, a local chain, turned 55. So they offered individual cheese pizzas for 55 cents. After picking up my child at day care & my husband from the subway, we went to get gas & some pizza. That location had sold out. At this point, I realized that Plan B - Baking Salmon would take "too" long & decided to check out the other Ledo's near us. The line at that location was unbelieveable (1 pizza per person, not family & I guess that each person had to be there.) as in those lines at Disneyland can not compare! Back-up to the drive between Ledo's where the mommy, trying to get her son to quit sucking his thumb innocently asks, "Do you want pizza?" to which she hears, "Pizza" in response. So we were kind of stuck with pizza & it was late. So I have been working on my hexagons. 1. Purchase hexagon papers (1.5 inch) several packages. 1a. Put them all into one ziploc retaining one set of instructions. 1b. Think about hole punching them all twice. 2. Think about the project. 2a. Will I persevere through the basting? 2b. Will I persever through the whipstitching? 3. Think about what kind of fabrics to use. 4. Think about it some more. 5. Look at inspiration photos. 6. Study design options. Think about the required fabric amounts for each/most. 7. Think about the "how to" options. 7a. baste through the paper? 7b. How did that gal do it on flickr? 7c. Do I have to trim the fabric into a hexagon? 8. Remember the Japanese whipstitching together method. 9. Think about the quilting. 11. Decide on "mosaic" almost charm, but not quite. 11a. How many pieces is too many? 11b. will it matter that there are a lot of singles? 12. Dive through fabric scraps & think about which ones to use & which ones not to use. 15. Remember that you'd rather have one bit of _________ that have to purchase a FQ. 16. "Do I have enough Polka Dots?" "Maybe." 17. Cut a pile of 3.5 inch squares. 17a. Sort into primary pile. 17b. Sort into double/triple/quadruple pile. 17c. remove some from 17b. 18. Look at yardage/fqs that still need to be trimmed of a 3.5 inch strip. 19. Generate new scrap pile. 19a. Go through & decide which can be donated/given away. 20. Trim selvages in case someone is still collecting them. 21. Trim the extreme trimmings into pet bed scrap bag. 22. Pile extra charm pack charms into "give away" pile. 23. Add to the 2.5 inch squares bag. 24. Add to the 3.5 inch novelties bag. 25. Rummage through "WIP" "KITS" & "UFO's" for fabrics that can be acquired/traded for the benefit of this project. 26. Think about whether or not the Liberties "go" with the other fabrics. 27. Ditto 26., just substitute Wm. Morris. 28. Scour the cat and novelties pile of fabric for suitable additions. 29. Make a "to go" bag. 29a. Find the bag - debate is it too big? Verify that it has a zipper. 29b. Get ziploc for the primary pile of charms. 29c. Grab the hexagon papers. 29d. Buy a hole punch. 29e. Grab your hand sewing box. 29g. "Where the heck are my pins?" 29h. "Don't have more pins?" 30. Drop your car off with the mechanic. 30a. Go to the food court. 32. Pin the hexagon to fabric. 33. Run out of pins. 33a. Decide to buy more pins. 33b. Think about buying more papers. 34. Start to baste the hexagons around the paper like that gal on flickr. 36. Put everything back in the bag. 36a. Decide to grab one more ziploc - to have the pinned bits separate from the non-pinned charms. 38. Think about whether or not this is a good to go (as in will I bother with it again) project. 39. Pull everything out & start punching more holes, & pinning more hexagons to the charms. 40. Now that the Mall is open (not just the Auto center & food court) bag everything up & wander back to the Auto center, by way of the restroom which is after the boys clothes, choose two super cute long sleeved t-shirts. 43. Decide not to buy a charm pack for this project - YAY! 45. At home roughly try to figure out the number of hexagons needed for this project. 45a. "How big is a queen sized quilt?" 45b. "I'm glad my hexagons are big-ish." 46. Think about punching more holes. 47. Think about cutting more charms. 47a. Decided not to include the Liberties or Wm. Morris prints. 48. Think about culling the duplicate pile. 48a. culled some, need to/might cull some more. 49 grab that extra ziploc & separate the pinned from the yet to be pinned. 50. remove big scissors, the tiny ones are enough for the thread snipping. Some of this is still on the "To Do" list. Which is quite different from the thinking about list. How do you cook steak? be very happy if I can also cook a salmon filet after the steaks are done. If it matters the temps. are in the low 60's & it is a bit windy. Back to the original question, how do you cook a steak? Marinade? My son at daycare in the big baby room. He gets there before there are enough toddlers to open the toddler room. My husband does the drop off & I have heard tales about the woe involved with the drop off. You see, he knows that this is the baby room & that he should be in toddlerville.